Calculated Industries® was founded in 1978. 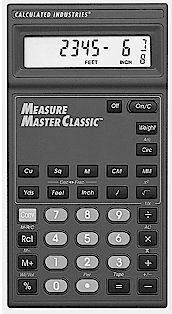 This company is one of the country's leading manufactures of specialty calculators and measuring tools. This calculator is designed for working with linear, area. and volume calculations. Solves many dimensional and shop math layout problems. Work in/convert to any dimensional format including circle solutions, weight per volume, unit pricing and more. Ideal for tradesman, fabricators, designers, woodworkers, craftsman, and technicians. The price of the 4015 is $29.95. Over 400 of the most common construction conversion combinations built-in! 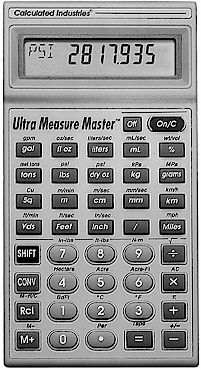 Ideal for international or US-based engineers, contractors, scientists, architects, inspectors or anyone dealing with scientific/physical unit conversions. The price of the 8015 is $49.95. Obtain fast, accurate take-offs from blueprints in any scale. Ideal for contractors, estimators, engineers, architects, and other professionals. 72 built-in scales, 6 custom scales, 2 built-in memories. Easy-to-read display shows measurement in feet-inches, metric, and other dimensional units. Calculates rectangular area and cubic volume automatically. Works in metric and imperial. The price of the 6020 is $59.95.